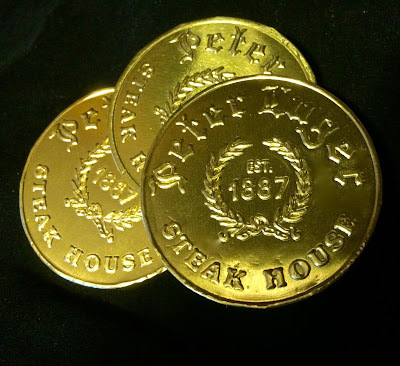 Brooklyn's Peter Luger Steak House is a local institution, widely considered the best steak house in New York City. 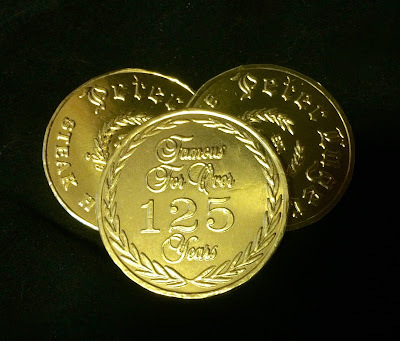 With 125 years to perfect the fare, it's no surprise that I was completely bowled over by every element consumed. I had certainly heard people speak of the porterhouse for two, creamed spinach, and the marvelous hot fudge sundae offered for dessert. 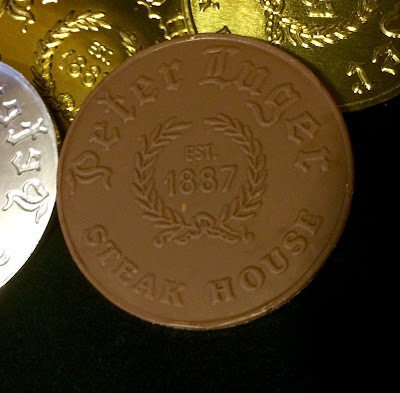 I was unaware, though, that when the customer has completed the meal and is sitting slumped over with a painfully full belly, the restaurant offers up one last treat- a handful of foil-wrapped milk chocolate medallions emblazoned with the restaurant logo. The large chocolate coins continue the theme of simple fare done better than anywhere, and I choose to see them as a gold medal awarded to each diner for consuming the most outrageously pleasing meal ever. At Peter Luger every customer wins the gold.